For Girard High football fans, last Saturday’s 53-48 win over Licking Valley in the Division IV state semifinal provided enough thrills and memories to last a lifetime. From the opening kickoff to the game-winning, 22-yard touchdown pass from Mark Waid to Nick Malito, the contest provided more twists and turns than a bag of pretzels. 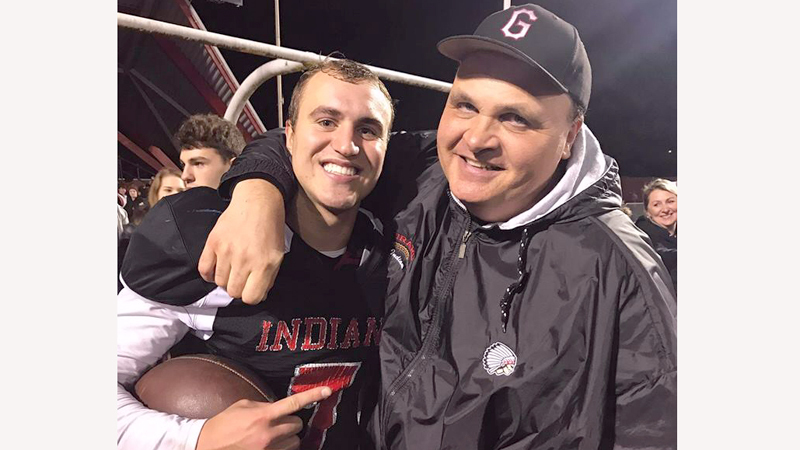 Still, as far as Girard superintendent David Cappuzzello is concerned, the highlight of the night occurred when the Indians trailed by 14 points, and in fact it didn’t happen on the football field. “There was a moment right after halftime when the student section emptied out, the students all gathered near the 50-yard line in front of the rest of the Girard fans, and they started leading the crowd in cheers,” Cappuzzello said. “It was like our entire community was all gathered together, all cheering as one. Indeed, Indian Fever has gripped Girard. The town has seemingly turned into a sea of black and red as the Indians prepare for Saturday’s Division IV state title game against Cincinnati Wyoming. The game, which will kick off at 8 p.m. at Tom Benson Hall of Fame Stadium in Canton, marks the first state championship appearance in Girard High history. Longtime Girard football supporters are reveling in the team’s success. Zuppo also recalls the 2001 season when the Girard offense went to the spread formation in mid-season and changed the way the game was played in the Mahoning Valley. “We’ve had some great teams, some really great players every decade,” Zuppo said. “There are so many memories when it comes to Girard football, but we’ve never seen anything like what we’re seeing right now. Zuppo said the success of the team has united the Girard community. Bill Rafferty played for Girard, and graduated from the school in 1971. For the past 30 years, he has been part of the chain gang working the sidelines at Indians home games. He will be in attendance in Canton on Saturday, wearing the same hat he has worn for all but one Girard game this year — the lone loss in week two at Hubbard. “You better believe I’ll wear that hat, and I’ll do whatever else it takes to bring home a win,” Rafferty said with a laugh. “Seriously, this has been a fun year. All around town, you see the G on cars, in yards, everyone has fallen in love with this team. Rafferty noted that the admiration has spread beyond Girard. Virginia Cochran has followed the Indians since moving to Girard in 1973. She is the mother of Girard athletic Director Nick Cochran. Virginia spent Monday evening watching a replay of the state semifinal contest. She attended the game, but admits she missed a good portion of the action. “Most of the time, I had my eyes closed and my ears plugged, I was that nervous,” Virginia said. “I cried Saturday night, and I was crying all day [Monday] while reliving the game. Tears of joy. Joe Cappuzzello spent 39 years in the Girard school system, including 16 as its athletic director before retiring in 2013. He believes that the Indians’ underdog role has helped create a special bond with Girard citizens. Joe Cappuzzello noted that his grandson, who plays high school football in Virginia, spent time with the Girard team while on vacation two years ago when he first took up the sport. “He really took a liking to the team, and he has been following them ever since. I think you’d be surprised at how many people from outside our area are paying attention,” Joe Cappuzzello said. Rob Kermec has served as the Arrowhead Stadium maintenance and groundskeeper for 33 years. He too says the personality and character displayed by the current cast of players and coaches makes it easy for fans to latch on to the team. “I have been telling fellow Girardians for the past five years that this team was going to be special,” Kermec said. “I’ve seen a lot of football in Girard, but this team has a work ethic like no other. They came early to practice, worked hard and then stayed later and worked out. Kermec said the team has provided the community with a boost when it needed it most. Last October, the city of Girard was rocked when police officer Justin Leo was shot and killed in the line of duty. Girard is aiming to become the 10th school in the Mahoning Valley to win a state football title. September 4, 2008 12:01 a.m.
February 27, 2014 12:06 a.m.